US, 1935, 90 minutes, Black and white. Barbara Stanwyck, Preston Foster, Melvyn Douglas, Moroni Olsen, Pert Kelton, Andy Clyde, Chief Thunderbird. 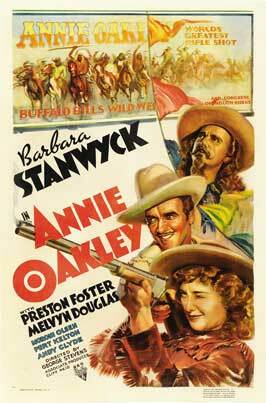 Annie Oakley is an enjoyable portrait of the famous sharpshooter. She was soon after this to be immortalised in Irving Berlin's musical, Annie Get Your Gun. 1. Enjoyable film of the '30s? Portrait of a legend? Annie Oakley's popularity? The later musical? 2. Black and white photography, re-creation of the period, Buffalo Bill's show? Musical score? 3. A piece of Americana, the American backwoods, the American dreams? 4. Annie and her family, shooting the quails, the poster of Toby Walker, the challenge for the shooting match, the disbelief about a girl, the quality of her shooting, deciding to lose so that he wouldn't lose his job? 5. Toby Walker, his vanity, with Buffalo Bill, with Hogarth and the management, in the pub, the bet, his winning and his arrogance? 6. Hogarth and his shrewdness, his being able to see Annie's qualities, his devotion to her, following her, his stances against Toby, the European tour, giving Annie the news about Toby’s difficulties with his sight? 7. Buffalo Bill, his show, his reputation, wary about Annie, his stances against Toby, his leadership of the men in the show, his camp, success, getting Sitting Bull, the accident to Annie's hand, the trip to Europe? 8. Annie and her success, the five shots and proving her worth? The clashes with Toby, the championship rivalry, in love, the accident with her hand, people keeping Toby away from her, the trip to Europe, her enjoyment of it, wanting to leave the show, wanting to find Toby - and the happy ending? 9. Toby and his vanity, the friendship with Vera, the clash with Vera, in love with Annie, his eyes, the accident, his being kept away, the encounter with Vera, at the sideshow, his watching the show, Sitting Bull pursuing him, Annie catching up with him? The tongue-in-cheek ending? 10. Sitting Bull, his reputation, watching the show, admiration of Annie, fear about the re-enactment of the battles, the jokes about his not being aware of civilisation: the bed, shooting the gas jets, the finale with his sighting Toby and taking Annie to him? 11. Vera, the vaudeville show with Toby, in the hotel, her later turning up, clashes with Annie? 12. Mc Ivor, the hotel, the bet? 13. The showmanship of Cody? The legends of the West and their origins, Bentine and his novels, the attitudes of whites to Indians, the cavalry and Cody coming to the rescue: `Another Redskin Bites the Dust'? Variations of attitude in treatment of the American Indians?